There are dozens of wedding vendors in each respective wedding category. However, there are typically only 2-3 wedding vendors in each category that are highly skilled. These wedding vendors annually book a large number of weddings each year. They thrive off of word of mouth referrals and are compensated according to their skill level/supply and demand of the market (brides and grooms interested in booking them). The next tier of wedding vendors provides a drastic drop-off in talent from the top tier. Those wedding vendors often charge much less than experienced & highly skilled vendors, may not require a deposit or signed contract, and may not provide the professionalism you want at your wedding reception. It’s like the old saying goes, “you get what you pay for”. 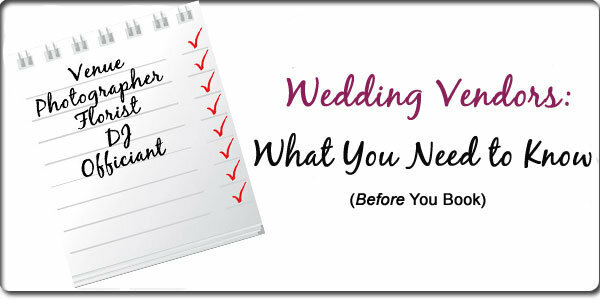 Please click on the wedding vendor links to see recommended wedding vendors and a list of questions you should be asking potential vendors for your wedding.